2. A review of available evidence including (but not limited to) your RTI manual handbook, student data systems, & completed meeting agendas. Completion of the full DIET-SB2 measure is a requirement for all districts actively participating in the ORTIi project. It is available and optional for all other Oregon school districts. Please contact us if you would like more information about RTI fidelity measures in other areas (including secondary literacy systems and elementary math systems). Completion of all three components of the DIET-SB2 will allow districts to obtain an online report showing strengths and areas of need, including a comparison to other schools that have completed the full DIET-SB2 assessment. 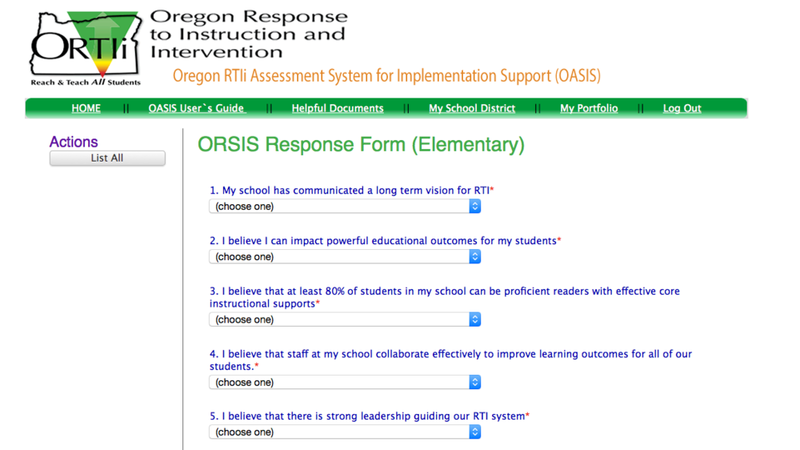 The District Implementation Evaluation Tool – District Based (or DIET-DB2) is a measure of your school district’s capacity to support RTI implementation at your schools. It was designed to assist school districts in strengthening their capacity to enable their RTI practices to be more effective and sustainable. It is completed by a district leadership team, once per year. It assesses the district in the areas of Leadership, Professional Learning & Support, Data-Based Decision Making, and Culture. The Intervention Planning and Assessment System (or IPAS) is an electronic system for managing universal screening and progress monitoring data, graphing and displaying student data, and enhancing decision making in a Response to Intervention (RTI) system. It allows teachers and administrators to screen all students in a broad range of subjects, including reading, math and written language, as well as to track behavioral issues. Based on that screening, students identified as needing intervention to maintain adequate academic or behavioral progress can then be monitored and tracked in the IPAS. For one of any specified number of reading, math, written language, or behavior assessments, IPAS is designed to store and manage initial screening data by school, grade, and screening period. IPAS currently includes the DIBELS, IDEL, Maze CBM, and Math CBM assessments, as well as several teacher defined behavioral assessment measures. Users can also import easyCBM data. Any assessment, academic or behavioral, can be added to the system, as long as goals, scoring, and intervention protocols can be fixed and described in detail.